These puppies are in excellent health,well socialized and ready for a new loving home. Males and female are available. 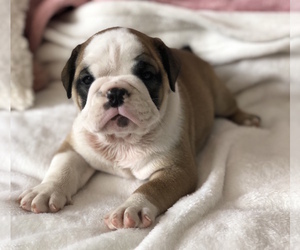 Overview: Named for its use in the sport of bull baiting, the English bulldog seems to have originated in the British Isles sometime prior to the 13th century. One of the few references to the sport dates back to 1209, and talks about a butcher's dogs that chased a bull through the English town of Stamford. This pursuit so pleased the earl of the town that he inaugurated bull baiting as a sport in his domain. 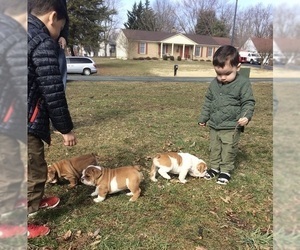 Today, the English bulldog makes a fine family pet. 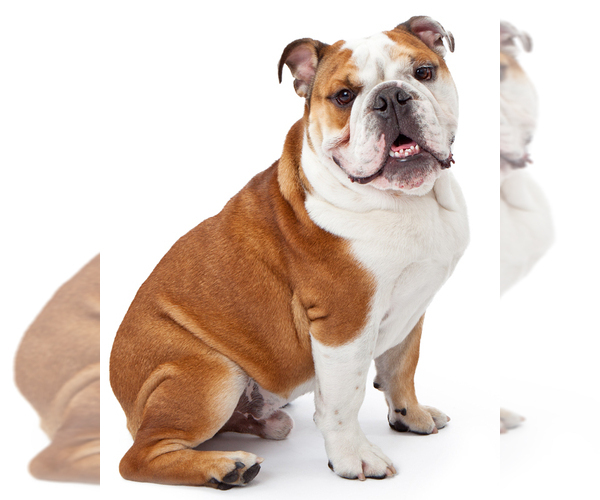 The AKC recognizes the breed simply as the bulldog. Coat: Minimal coat care is needed for this dog, but the folds around the tail and facial wrinkles should be cleaned every day to prevent build up of dirt or rubbish. Failure to perform this regularly can lead to infection of the skin. 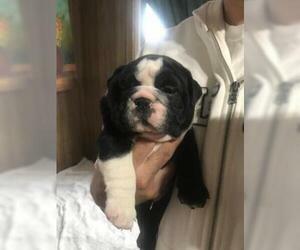 Character: The English bulldog has a sweet, gentle disposition. 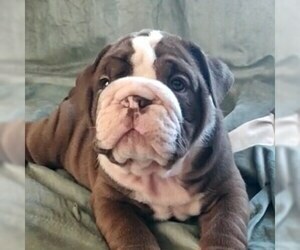 Dependable and predictable, the bulldog is a wonderful family pet and loving to most children. People-oriented as a breed, they actively solicit human attention. However, they have retained the courage that was originally bred into them for bull baiting, so they make fine watchdogs. Although they generally get along well with other family pets, English bulldogs can be aggressive to unfamiliar dogs. Care: Many Bulldogs tend to wheeze and snore, while some drool because of their short snouts and outward protruding lower jaw. These are normal physical side-effects of the breed. Because of the compressed nature of the jaw, extra care needs to be taken in keeping the teeth clean. Early dental care, with daily brushing, will get your Bulldog in the habit so that it is grooming time that is looked forward to. Bulldogs love their daily outings, however, do not expect them to walk or jog long distances, or dart from great heights. The short-hair and snout of the Bulldog make it sensitive to extremely hot and humid climates, and most do not enjoy swimming. Activity: English bulldogs make fine apartment pets and do not require a yard. Bulldogs love their daily outings, however, do not expect them to walk or jog long distances, or dart from great heights. The short-hair and snout of the Bulldog make it sensitive to extremely hot and humid climates, and most do not enjoy swimming. Using sun screen lotion on the dog's skin if you are going to be spending time in the sun, and making sure your Bulldog has plenty of water is essential for healthy days out. 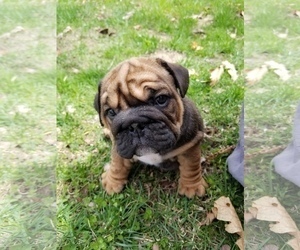 Health Issue: t is a member of the brachycephalic breed class, meaning that is has a short head and snout. This physical characteristic can lead to a number of possible health challenges, including those of the nose, eyes, teeth, and respiratory system. The nostrils are narrower, and the soft palate longer in the Bulldog (meaning that the skin of the palate can partially obstruct the airway), creating the potential for severe breathing problems, especially when the dog is overheated or over excited. Heat is a special concern with this breed, since it is not able to cool itself efficiently through panting, as other breeds do. 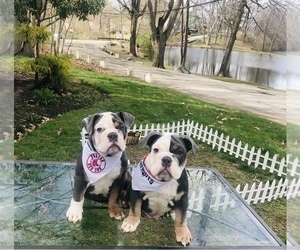 Because of the extra amount of work that is involved with bringing air into the body, any situation that requires breathing harder can lead to irritation and swelling of the throat, which can also lead to respiratory distress in the Bulldog. Heat stroke is also more common with this breed.